Time : 9:00 am check-in; 10:00 am panels begin; Keynote address at 4:00 p.m. This is a free event, open to the public, and all are welcome! Joy Ladin is the author of nine books of poetry, including 2017’s The Future is Trying to Tell Us Something: New and Selected Poems and Fireworks in the Graveyard, and two Lambda Literary Award finalists Impersonation and Transmigration. 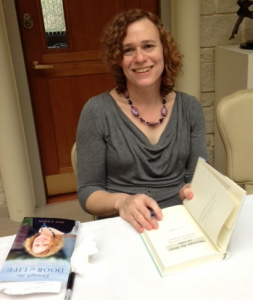 Her memoir of gender transition, Through the Door of Life, was a 2012 National Jewish Book Award finalist; a new work of creative non-fiction, The Soul of the Stranger: Reading God and Torah from a Transgender Perspective, came out in 2018 from Brandeis University Press. Her work has been recognized with a National Endowment of the Arts fellowship and a Fulbright Scholarship, among other honors. She holds the David and Ruth Gottesman Chair in English at Stern College of Yeshiva University.